When talking about global warming, we often tend to think about droughts, water shortage and desertification. But we must not forget that 72%, almost three quarters of our planet is covered in oceans – and believe it or not, that’s where global warming will strike the hardest. Oceanic global warming is causing many marine species to change their habits, their breeding patterns, and migrate towards the poles, much faster than land animals, a study conducted by 17 institutions across the world concluded. As these species move, they disrupt the food chain, affect all sea life, as well as humans who depend on the sea for food. The report, “Global imprint of climate change on marine life,” will be a part of the Intergovernmental Panel for Climate Change, IPCC, Assessment Report due for publication in 2014. The IPCC is the world’s top organization for estimating the extent and threats of climate change, as well as assessing scientific, technical, and socioeconomic information concerning climate change, its effects, and options for adaptation and mitigation. The only good news this study brings is that previous estimations of oceanic climate change were fairly accurate – 81 percent of changes across different populations and ocean basins were consistent with the expected impacts of climate change. In order to conduct this massive study, researchers gathered information from peer reviewed literature, creating a database of 1,735 changes in marine life from the global peer-reviewed literature, including marine mammals, fish, seabirds, turtles, squid, plankton, molluscs, deep sea invertebrates and crustaceans, mangroves, seagrasses and deepwater algae, covering the polar, temperate, subtropical and tropical oceans. The study found that phytoplankton zooplankton, and bony fish show the largest shifts; this is especially worrying because they are the very backbone of the food cycle. For example phytoplankton – which provide the basic food for all life in the seas – are now blooming an average of six days earlier in the season, compared to land plants. 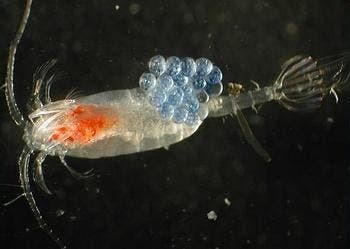 Baby bony fish are hatching on average 11 days earlier in the season. It’s estimated that oceans absorbed 80 percent of the extra heat put into the Earth system by humans, but nevertheless, warmed slower due to their sheer size. “When you see changes as large as these, life generally has three options – migration, adaptation or extinction. In the case of migration and extinction, these can directly affect industries like fishing and tourism which depend on local sea life,” he said.